I'm so glad I decided to share my pregnancy news with all of you and thanks so much for all the lovely comments. 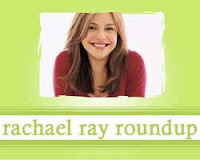 All those people who think this blog is written by Rachael Ray are going to be really confused by that post. Things are still going well! The baby kicks me all day long, which can be distracting at work, but I'm getting used to it. I've been doing a ton of cooking, which I will really try to make a priority even after baby comes (stop snickering, you moms out there!). Most Shocking Post of the Week: Anthony Bourdain talked to Rachael Ray and how did she react? She was "unfailingly polite." Find out what else he thought at his blog. The New York Times discusses the South Beach Wine and Food Festival, with a few tidbits on Rachael Ray's visit. People magazine asked Rachael if she had any advice for new mom, Jennifer Lopez. Dara of Chick in the Kitchen adapted Rachael Ray's recipe for Spicy Hummus. Jessica of What's Cooking in the Orange Kitchen? tried one of my all-time favorites - Italian Mac and Cheese from Get Togethers. Mimi of 1700 Miles of Cooking doesn't sound like much of a Rachael Ray fan, but she certainly likes Rachael's recipe for Leeky Creamy Chicken and Dumpling Stoup, with a few adaptation. Tracy Block of Riptide 2.0 has some details about the party hosted by Rachael Ray at the Hotel Victor. Bizbash has a few more details and pictures. Yumsugar features a great use of leftover pizza from Rachael Ray's magazine in a recipe called Cheesy Stuffed Portobellos. Sean of One Week Job will be spending his week at Rachael Ray's talk show. The Agnostic Cook uses Rachael's recipe for Vodka Cream Pasta sauce as his go-to sauce for Italian dishes. Patsy of Family, Friends and Food was not wowed by Rachael's recipe for Cheddar Cheese and Macaroni. Rachael Ray heads back to high school again for an annual fundraiser. Hi Madeline, thanks for the link. And, congrats on your happy news! Thanks for your post, Dara! I know! It's shocking, isn't it? I missed it! Congratulations on your pregnancy! You're getting pretty close there, huh? I was very very large around this time 8 years ago, myself! Thanks, Jennifer! I just passed the 34 week mark. Freaking me out a little!